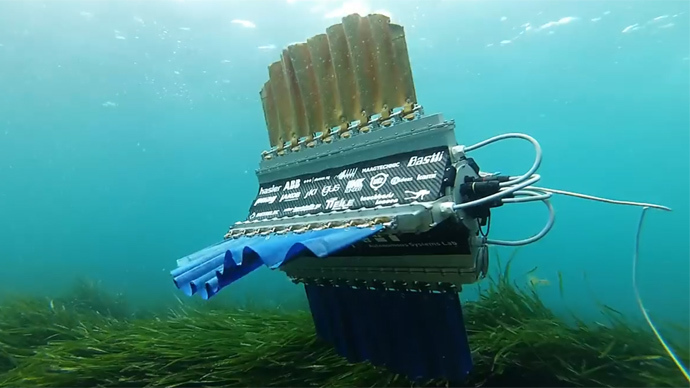 For those who grew up on the wonders of Jacques Cousteau’s silent world, a group of Swiss students just might revolutionize the filming of marine life with a highly maneuverable cuttlefish-inspired robot called Sepios. Actual cuttlefish are not fish at all, but molluscs. Like related squids, they swim by jet propulsion; forcibly expelling water through a siphon while using lateral fins for stabilization, steering and propulsion. Sepios actually has four independently controllable fins that allow it to rotate on any axis and translate in any direction. Each of these fins contains nine rays which are put into action by a sensor-coupled motor (servomotor). Each of these rays has a range of 270 degrees, allowing the fins to generate thrust in angled positions. In turn, each of these rays has a range of 270 degrees, allowing a fin to also generate thrust in angled stances. The students have likened Sepios to a hybrid of a cuttlefish and a knife fish. Due to the system design, different configurations of fins are used to modify movement. For example, the creators say that a knifefish can be mimicked through the use of a single downward-oriented fin. In turn, two-finned cuttlefish configurations are also possible. At 70 centimeters long, with a fin span of 95 centimeters, the final version of Sepios can dive down to a depth of 10 meters and move at a cruising clip of 1.8 kilometers per hour. It has a battery life of 1 hour 30 minutes. The team has also considered modifying Sepios with sensors that would enable to run (make that swim) an obstacle course. It also generates very little turbulence, meaning the silent world will remain tranquil when Sepios swims among the varied creatures of the sea.